I have a confession to make. For the past year I’ve been using a 27-inch iMac as my primary workstation. I always said that if I had a less mobile lifestyle the iMac is probably the machine I’d end up with (that was prior to the announcement of the new Mac Pro of course). This past year has been the most insane in terms of travel, so it wasn’t a lack of mobility that kept me on the iMac but rather a desire to test Apple’s new Fusion Drive over the long haul. It’s entirely possible to mask the overwhelmingly bad experience of a hard drive in a high performance machine by only sampling at the beginning of the journey. When the OS is a clean install, the drive is mostly empty and thus operating at its peak performance. Obviously Apple’s Fusion Drive is designed to mitigate the inevitable performance degradation, and my initial take on it after about a month of use was very good - but would it last? I’m happy to report that it actually did. So today’s confession is really a two-parter: I’ve been using an iMac for the past year, and I’ve been using a hard drive as a part of my primary storage for the past year. Yeesh, I never thought I’d do either of those things. This year the iMacs get incrementally better. Displays and resolutions are the same, but silicon options are a bit quicker, 802.11ac is on deck and the SSDs all move to PCIe (including Fusion Drive). As tempted as I was to begin my first look at the 2013 iMac evaluating the impact of going to faster storage, it was the entry-level model that grabbed my attention first because of a little piece of silicon we’ve come to know as Crystalwell. 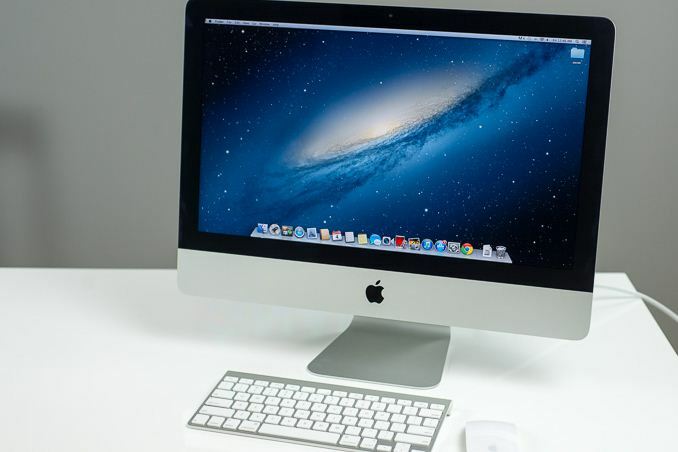 The entry level 21.5-inch iMac is one of the most affordable options in Apple’s lineup. At $1499 Apple will typically sell you a dual-core notebook of some sort, but here you get no less than a quad-core, 65W Core i5-4570R. That’s four cores running at 2.7GHz, and capable of hitting up to 3.2GHz. In practice I pretty much always saw the cores running at 3.0GHz regardless of workload. I’d see some excursions up at 3.1GHz but for the most part you’re effectively buying a 3GHz Haswell system. The R at the end of the SKU connotes something very special. 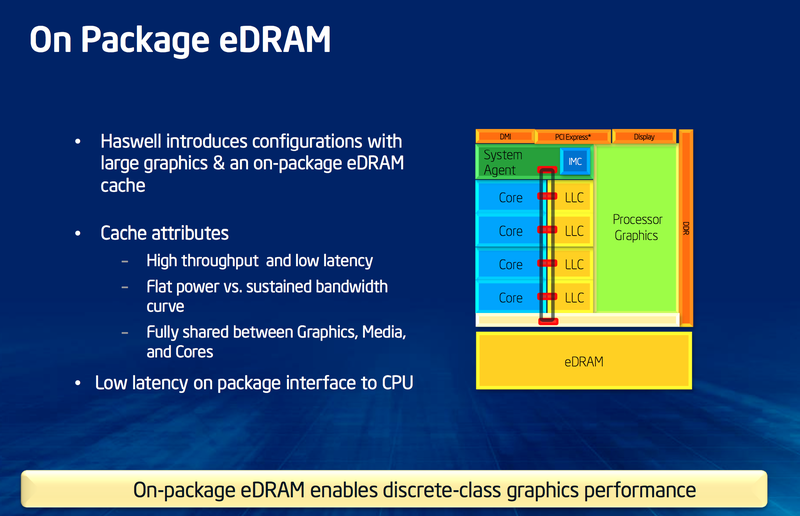 Not only do you get Intel’s fastest GPU configuration (40 EUs running at up to 1.15GHz), but you also get 128MB of on-package eDRAM. The combination of the two gives you a new brand: Intel’s Iris Pro 5200. The Iris Pro 5200 is a GPU configuration option I expect to see on the 15-inch MacBook Pro with Retina Display, and its presence on the iMac tells us how it’ll be done. In last year’s iMacs, Apple picked from a selection of NVIDIA discrete GPUs. This year, the entry level 21.5-inch model gets Iris Pro 5200 while the rest feature updated NVIDIA Kepler discrete GPUs. It’s the same bifurcation that I expect to find on the 15-inch MacBook Pro with Retina Display. As we found in our preview of Intel’s Iris Pro 5200, in its fastest implementation the GPU isn’t enough to outperform NVIDIA’s GeForce GT 650M (found in the 2012 15-inch rMBP). Apple’s engineers aren’t particularly fond of performance regressions, so the NVIDIA GPUs stick around for those who need them, and for the first time we get a truly decent integrated option from Intel. Most PC OEMs appear to have gone the opposite route - choosing NVIDIA’s low-end discrete graphics over Intel’s Iris Pro. The two end up being fairly similar in cost (with Intel getting the slight edge it seems). With NVIDIA you can get better performance, while Intel should deliver somewhat lower power consumption and an obvious reduction in board area. I suspect Iris Pro probably came in a bit slower than even Apple expected, but given that Apple asked Intel to build the thing it probably felt a bit compelled to use it somewhere. Plus there’s the whole believing in the strategy aspect of all of this. If Apple could shift most of its designs exclusively to processor graphics, it would actually be able to realize board and power savings which would have an impact on industrial design. We’re just not there yet. 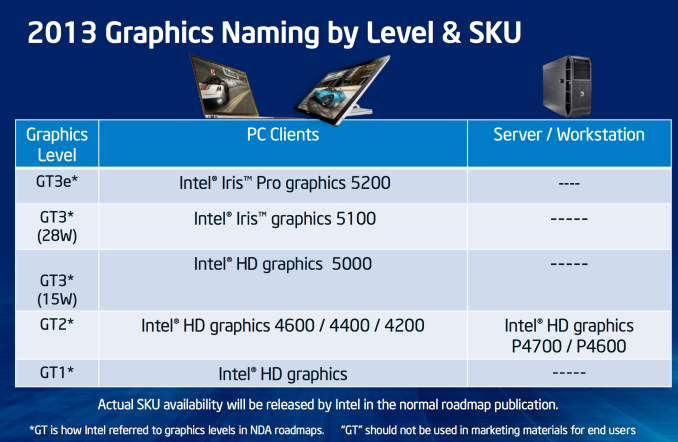 Whether we ever get there depends on just how aggressive Intel is on the graphics front. I already went through what the 128MB eDRAM (codename Crystalwell) gets you, but in short that massive on-package memory acts as a L4 cache for both the CPU and GPU. You get 50GB/s of bandwidth in both directions, and access latency somewhere between L3 cache and main memory requests. OS X doesn’t seem to acknowledge Crystalwell’s presence, but it’s definitely there and operational (you can tell by looking at the GPU performance results). Some very specific workloads can benefit handsomely from the large eDRAM. At boot I suspect key parts of the OS are probably cached on-package as well, something that’ll have big implications for power usage in mobile. Unfortunately my review sample came with a hard drive, and these new iMacs aren’t super easy to break into (not to mention that Apple frowns upon that sort of behavior with their review samples), which hampered the user experience. OS X continues to do a good job of keeping things cached in memory, and the iMac’s 8GB default configuration helps there tremendously. Whenever I was working with data and apps in memory, the system felt quite snappy. I’ll get to the benchmarks in a moment. 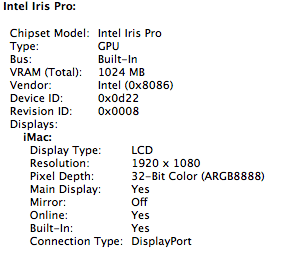 The non-gaming experience with Iris Pro under OS X seemed fine. I noticed a graphical glitch under Safari in 10.8.5 (I saw tearing while scrolling down a long list of iCloud tabs) but otherwise everything else looked good. In typical Intel fashion, you get nothing for free. The 128MB of eDRAM comes at the expense of a smaller L3 cache, in this case 4MB shared by all four cores (and the GPU). Note that this tradeoff also exists on the higher end Core i7 R-series SKU, but 6MB of L3 is somehow less bothersome than 4MB. This is the lowest core:L3 cache ratio of any modern Intel Core series processor. The 128MB eDRAM likely more than makes up for this reduction, and I do wonder if this isn’t a sign of things to come from Intel. A shift towards smaller, even lower latency L3 caches might make sense if you’ve got a massive eDRAM array backing it all up. I don't think its just that. Compared to the competition like the Trinity's iGPU and the GT 650M, the texture fill rate is rather low. That impacts performance not only in texture bound scenarios with settings cranked up but anti-aliasing as well. The fillrate of the top of the line Iris Pro 5200 is about equal to Trinity while the version in the iMac would fall short. The GT 650M is 40% better than the top of the line Iris Pro and over 55% better than iMac version. Or that the working set of most benchmarks (if not most apps) is captured with a 4 or 6MB cache?